LinkedIn is a place to learn about careers – from businesses and professionals happy to share. Upload your address book and start connecting. It's never too early to start building your business brand. What do people see when they Google you? If LinkedIn is Your Next Resume, it's time to get started learning how to use LinkedIn. Get started on LinkedIn today. Brilliant! You can get to the site here. TED has unveiled a new Web site that it hopes will solve this problem—by organizing educational videos and letting professors “flip” them to enhance their lectures. The new Web site, unveiled today, lets professors turn TED’s educational videos—as well as any video on YouTube—into interactive lessons inspired by the “flipped” classroom model. The site’s introduction is the second phase of an education-focused effort called TED-Ed, which began last month when the group released a series of highly produced, animated videos on a new YouTube channel. The TED-Ed site is both a portal for finding education videos and a tool for flipping them. On one page, videos are organized by themes, such as the pursuit of happiness and inventions that shaped history. Instructors who want to use videos that are directly related to the subjects they teach can visit another page, where videos are organized in more traditional categories such as the arts and health. TED’s videos are displayed on lesson pages that include multiple-choice quizzes, open-ended questions, and links to more information about the material. Professors who don’t want to rely on the premade content can press a button to flip the videos and customize some of the questions. With each flipped video, professors receive a unique Web link that they can use to distribute the lesson to students and track their answers. I have spent the past six months working with a team to develop an app about the Second World War, Timeline World War 2. The process has given me a profound understanding and respect for exactly what is possible. Apps on a tablet device quite simply give you all the combined benefits of books, television, the web and radio, with few of the disadvantages. An app allows the author to use the most appropriate medium: chunks of well-written text when prose is called for to explain a key turning point; still photographs to illustrate every aspect of the war; moving film archive to bring an unparalleled immediacy, showing things like Stuka dive-bombers shrieking out of the sky; audio files of speeches; filmed eye-witness testimonies of participants; and graphic maps that show the ebb and flow of war in a dynamic way rather than as a series of static slices of time. GCHQ, the UK government's communications headquarters, has released two new -- well, 70 years old, but new to us -- cryptanalysis documents by Alan Turing. The papers, one entitled The Applications of Probability to Crypt, and the other entitled Paper on the Statistics of Repetitions, discuss mathematical approaches to code breaking. According to the GCHQ mathematician, who identified himself only as Richard, the papers detailed using "mathematical analysis to try and determine which are the more likely settings so that they can be tried as quickly as possible." The papers don't seem to be online yet, but here's their National Archives data. The iPad is growing at a faster rate than the iPhone and has achieved in two years what the iPhone took four. The Mac showed significant weakness though the previous year’s Q1 had exceptionally high growth of 32%. The Mac still grew faster than the market and therefore gained share. Jesse Storimer shares his experience with 4 Months of ebook Sales … nearly $18,000 in 4 months – not too shabby! I've been interested in writing an ebook for a while. The first time I tried I didn't finish because I couldn't stay motivated. While this may initially be aimed at addressing student demand and overcrowding issues, how long before a college decides this is a cheaper and more effective option than face-to-face instructor-led classes? Could you imagine a future where a college offers all of their Freshman Writing, World Civ, or College Algebra in this fashion? What about statewide initiatives – offering the same self-paced Freshman Writing course at all the colleges in a state? College presidents would jump at this opportunity: shared resources, greater consistency, common outcomes, little or no dependance on faculty – at least in the traditional sense. Think it can't happen? What about community colleges in Texas – no tenure, no unions – lots of power. A textbook gets adopted in Texas, it impacts the entire country. What would happen if Texas embraced this model for delivering general education courses? It wouldn't be pretty. The media conglomerate Pearson today announced a partnership with Ivy Tech Community College of Indiana to provide online, self-paced courses that the company says will help Ivy Tech deal with student demand and overcrowding issues in required general education courses. For Pearson, which already sells modules for instructor-led courses, the move represents a further step in the company’s strategy of inserting itself into virtually every area of e-learning short of full degree programs. “We thought it was time for us to have a self-paced play that our partners could then plug into their institutions and get more students into higher education,” said Don Kilburn, the CEO of Pearson Learning Solutions. Meanwhile, the partnership allows Ivy Tech to refer certain students to hands-off self-paced general education courses — which it does not currently offer — without building such courses itself. “It is a way to test out that modality and see if it works for some students without taking a lot of business risk on our own,” said Kara Monroe, associate vice president for online academic programs at Ivy Tech. Time to Leave the MacBook Air Home? Andy Ihnatko thinks that in Apple's post-PC world you can leave the laptop at home and function with just an iPad. I don't have the 3rd generation iPad, but Ihnatko's not far off. Accessing your home PC with a retina display sounds like an amazing experience. The LTE connection doesn't hurt either. Whatever we want to call it we’re definitely in some sort of slow-roast revolution. I can tell because over the past six months, I’ve let go of my last shreds of desire for an 11in MacBook Air. You may recall the little passion play I went through last year. I had a review unit for a month or two and the first time I travelled with a full-featured MacBook in the magazine pocket of my smallest satchel instead of in a special bag filled with accessories, I fell deeply in lust. I might have pulled the trigger and bought one, if not for the fact that I’d upgraded my MacBook Pro just a few months earlier. Two things have happened since then. First, iOS app developers have become much bolder. On Day One, they were writing apps that treated the iPad as a content consumption device. By the time the iPad 2 was released, they thought of it as a machine that could handle many functions of a ‘real’ computer, during those specific instances when it’s just not worth hauling around a full-sized notebook. Today, more and more developers are confident that the iPad is indeed a real computer, and are expressing that confidence by making desktop-class iOS apps – with Apple leading the way, of course. The new iPad edition of iPhoto isn’t just competitive with the desktop version, the tactile nature of the iPad makes it superior to most of the available consumer-grade image editors for Mac OS and Windows. The second thing was the arrival of the third-gen iPad. Dammit, this is a sweet display. I expected that the Big Win of the Retina display would be crisper text and sharper graphics. Naw. It turns out that the 2,048 x 1,536 screen opens up the iPad to new functions that it couldn’t really handle very well. VNC sits at the top of that list. VNC was a bit clumsy on the iPad 1 and 2. On the new iPad, it’s damned-near perfect. The iPad’s display exceeds the resolution of your MacBook back home, and the LTE mobile broadband dramatically reduces the range of situations under which you won’t have a decent internet connection. No, I no longer wish I had an 11in Air. What I have here – a third-generation iPad and an Apple Wireless Keyboard – is better. I have better-than-good native iOS apps to handle almost all of my mobile needs. When only a desktop app will do, I have VNC, and/or the wonderful OnLive Desktop service that allows me to run Microsoft Office on a virtualised Windows 7 server. The report explained Comcast is now only offering a “conditional recommendation” for using Apple’s AirPort with its home networking services using IPv6. This is opposed to its usual recommendations given to Cisco and D-Link gear. Apple’s AirPort products still support IPv6, but users must download the previous AirPort Utility 5.6 tool to access the settings. 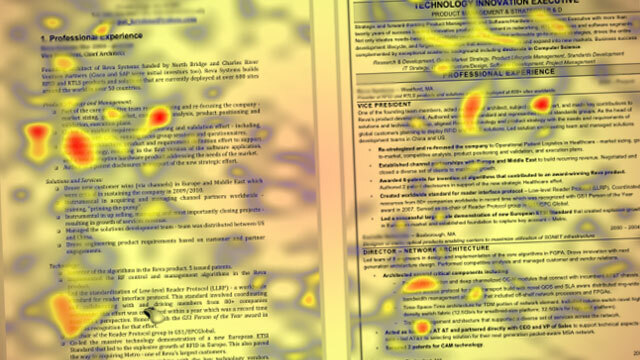 Should we move away from paper resumes? Should LinkedIn be everyone's default resume? Many resumes end up at the bottom of the pile, and with the results of a recent study highlighted by BusinessInsider, it's no wonder: recruiters only look at your resume for an average of six seconds before making a decision about you. Here's what information they actually see. According to Leanne Smith, New study shows college students who text during class not paying attention to lectures. I don't think anyone disputes this fact. What I – and like-minded faculty – aim to do is to engage these students, so they have no interest in texting in class or even better involve their mobile devices (cell phones, smart phones, tablets, etc) in the learning process. Don't blame technology for students' lack of interest ing class – without a cell phone, these same students would be doodling on a notepad and daydreaming. A university professor in Pennsylvania has completed a study and written a soon-to-be-published paper on the effects of text messaging by college students during class. A new study says texting in class decreases students' ability to pay attention. Students who send and receive texts during class have a hard time paying attention to lectures and risk not learning as much as they would if they weren’t texting and were paying attention. Yes, this is a real study highlighted in a press release from Washington, D.C.’s National Communication Association, which will publish the paper in its July print issue of its journal Communication Education. it's clear digital books are taking over. The good news for IT workers: jobs are relatively plentiful and about to become more so. The bad news is that salaries are stuck in low gear. Unemployment for IT workers is 3.8% compared with the national average of 8.3%, reports Coomputerworld in its annual Salary Survey of over 4,000 people. Plus 87% of IT hiring managers who took part in the survey said they will be hiring in the next 12 months. The bad news is that open jobs aren't causing salaries for IT workers to rise much. Salaries increased a paltry 2% in 2012 ... with bonuses cut by 1%. Benefits like 401K matches have been slashed, too. Owen thinks Technical Books Are Broken. I agree, but I think his solution of on-demand print books doesn't really solve the problem. I think enhanced e-books with rich interactive elements would do so much more to address the issues with print books. The problem with e-books that he identifies has more to do with trying to recreate the print book experience in an e-book, versus using e-books to redefine what a book is. Technical books also go stale very quickly. Even my copy of the above HTML reference is already out of date. It doesn't include the common HTML5-specific tags like section and header. And as the HTML5 standards change (like any technical topic does - very quickly), the book becomes more and more stale. Offering online supplements to the books keeps the information that the "book" offers more fresh, but then, is that really the book? If I wanted an online reference, and let's face it -- there are plenty of great, free online HTML5 references, wouldn't I choose one of those instead of paying for a hardcover book? The main issue I have with technical books is that their digital incarnations are insufficient. We've somehow failed to develop a useful transition from paper to digital that includes a useful way to integrate the two mediums. The online versions tend also to be very poorly formatted for use when at the terminal. I actually despise using the Kindle version of most technical books because they're not anywhere near as handy as flipping paper pages. The mere thought that the paper version works better indicates to me that something is wrong with the UX of the digital version. I think the point that users "liked IG because it wasn't FB" is very true. I know users who have already deleted their Instagram accounts – there are even services such as Instaport, designed to let Instagram users download all of their content. In the startup world, this will have two side effects: For one, Facebook is likely to become the exit of choice Google once was. Two, the size of the Instagram transaction (some of it in stock) is likely to act as a beacon for any startup harvesting users by the millions. It sets an inflationary precedent. with this transaction, the ultra-dominant social network acted like an elephant scared of a mice. Instagram has 35 million users? Fine. But how many are using the service more than occasionally? Half of it? How many are likely to switch overnight to a better app? Kevin Systrom and Mike Krieger designed the ultimate stripped-down application: a bunch of filters and a few basic sharing features. That’s it. It is both Instagram strength and main weakness. Such simplicity is easy to replicate. At the same time, if Facebook-Instagram wants to raise the feature-set bar, it might lose some of its users base and find itself competing with much better photo-sharing applications already populating Apple or Android app stores. And if it chooses to grant some level of exclusivity to the Instagram app, how will the audience react (especially when you read comments saying “We liked IG because it wasn’t FB”)? Instagram had no monetization strategy–other that a lottery-like exit. This says applying any kind of cost per user ($33 for the theory in vogue) is bogus. Being unable to project any sustainable revenue mechanism makes such a valuation process completely pointless. In Instagram’s case, the only way to come up with a price tag was guessing the amount of money a small group of suitors–Facebook, Google and Twitter–might be willing to cough up for Instagram’s eyeballs. If this deal shows one thing, it is the frenzied, cutthroat competition these three players are now locked in. Mark Zuckerberg is not through with collecting hatching eggs. He won’t be alone either. Switching between media 27 times an hour is super multi-tasking – Wow! A new study revealed by Time indicates that those who grew up with mobile tech are restless and emotionally detached consumers, switching between TVs, magazines, tablets, smartphones, or channels within platforms about 27 times an hour while experiencing “fewer highs and lows of emotional response.” The study says that these “digital natives” use media to “regulate their mood,” and that as soon as they’re bored or tired, they shift their attention elsewhere. And while a cursory glance at any vacuous, smartphone-equipped person might be enough to declare the findings plausible, Time’s study appears to be more scientific: researchers used biometric monitoring and point of view video capture to monitor people’s daily media consumption habits. Could Windows 8 be Vista 2? As some of you know, I’ve been using Windows 8 Metro for nearly 7 months (since its debut at Microsoft BUILD conference in September.) More recently I decided to investigate Windows Phone to get even further immersed in the Metro experience. Windows Phone (7.5) has been a pretty nice experience overall. But there’s one thing that definitely comes to light using Windows Phone and Windows 8 together. Windows 8 Metro is very much incomplete. Everything that’s beautiful about Windows Phone’s fast and fluid experience is a bit clunky feeling in Windows 8. All of the amazing typography and text animations are crude and under-developed in Windows 8. All of the clever physics of Windows Phone have been reduced to simplistic movements in Windows 8. I’m hopeful that Microsoft can bring some more of the spirit of Metro to the desktop, because it really is a nice modern experience on phones. I haven’t toyed around with Windows Phone 7 so perhaps it shipped in an equally unfinished state and they got it right with the follow-up release. If they can get more of Metro in time for Windows 8, great. If not, I hope Windows 9 follows quickly. Very cool seeing this, but surprising that the max date rate is only 75 Mbps – I'm getting a max rate 130 Mbps. It's likely that I'm too far from the wireless router setup for channel bonding to get the full speed. … even though it's still the best HTML5 platform on the market. No one disappointed in Google or Microsoft? Sigh … just can't win! Apple’s new iPad, already a hit with consumers with its high-resolution display, is nonetheless underwhelming some HTML 5 developers. The tablet’s iOS 5.1 operating system complicates HTML 5 data storage, offers no expanded HTML 5 support, and the tablet’s Web performance is at best only at par with iPad 2. It’s too much to call these “setbacks” and no one is saying Apple is reneging on its aggressive support for the emerging Web standards that will eventually let browser-based apps behave much like native apps. But for some, Apple’s decisions are a compromise they could live without. Sencha, an HTML 5 tools vendor, last week posted its “HTML 5 Scorecard” for the new iPad and iOS 5.1, calling the results a “mixed bag” for Apple. The vendor’s scoring weighs two criteria: completeness – how much of the various HTML 5 elements are present – and correctness – how well it supports these elements, says Aditya Bansod, senior director, product management, for the Redwood City, Calif., software company. The blogpost also included results of a pair of Web benchmarks testing the new tablet’s Web performance. The name Louisville Slugger is synonymous with baseball. Name one of the greats and chances are he spent his career swinging a Slugger. Hillerich & Bradsby, the company behind the brand, has made more than 100 million bats since 17-year-old John A. “Bud” Hillerich first turned one in 1884. The earliest bats were made by hand on lathes in about 15 minutes. Now CNC machines crank them out a wood bat in about 45 seconds, using northern ash grown in Pennsylvania and New York. Take a look inside the factory to see how it’s done. Does Open Source Make it Too Easy to Cheat? In my senior year of high school I hacked my AP Computer Science class competitions. It was the first year the school taught Java. The teacher wanted to get everyone excited about programming by introducing weekly competitions. A class favorite was the Robocode competitions. We paired off into groups of two to build robot AIs. We all looked forward to the Friday classes where we had a 1 on 1 single elimination tournaments. This went smoothly for the first couple of weeks. I felt excited to watch the robots evolve from week to week. One Friday competition it took a turn. A few of my classmates found that they could take open source robots from the internet. They won by a gigantic margin, so naturally other students followed suite. This behavior spread virally throughout the class, and soon the Friday competitions turned from building the best robots that you could, to finding the best robots that someone else made. My partner and I refused to poach someone else's robot. We were determined to win by our own efforts. We continued to build our robot, but we soon realized that the internet had far better AI skills than we did. Eventually we came up with a plan to win. We changed the name of the robot we were building to 'GhostlyImage'. We decompiled the jar file for the robocode environment on the computer that the competition was held. After studying the source code for a while we eventually found the place where a robot scanned another. We modified the code so anytime our robot, 'GhostlyImage', was scanned it would fill the event with false information. For an added bonus we had it print in the scanner's terminal 'You have been Phantomized!'. On the first competition that we used the modified environment no one figured out what was wrong. They just found it strange that their poached bots acted erratically. The consensus at first was that our movement must be throwing their robots off. The terminal output wasn't noticed. Why would they? They didn't write anything to print there. They were using someone else's bot. It wasn't until later on that it dawned on them that something was terribly wrong. One of our classmates finally noticed their terminal output was filled with 'You have been Phantomized!' messages. We then told the class how we had been beating them. Quite pleased with ourselves that we figured out a way to beat the top robots by bending the rules of robocode. From David Strom … Lantronix Has iPad Print Server Solution – a little pricey at $150, but a great solution for home, the small office, and even the enterprise. If your company has iPads and other iThings on its network, one of the frustrations is not being able to print from them. In the past, you needed a printer that was designed for iPrint (such as the HP Envy Series we reviewed here). Now Lantronix has its xPrintServer that can do the job for any network-connected printer. And it is so easy that it will take you longer to read how to do it than to actually implement it. The print server is about the size of an iPhone, and has two connectors: an RJ-45 for your Ethernet network and a power plug. Plug it in and, in a few moments, you are good to go. If your app has a print dialog icon, you can now start printing from your iThing. The print server will auto-discover any network printer that is on the same network subnet. If you want to print to another subnet, you will have to go through some manual configuration, using the printer's built-in Web server. If you have iPhones, you will of course need to turn on their Wi-Fi radios and connect to the same subnet to see the print server. Lantronix has this funny short video with the loveable IT guy featured here. As he says, "Try it now." The box costs $150 and is available from numerous online electronics retailers. 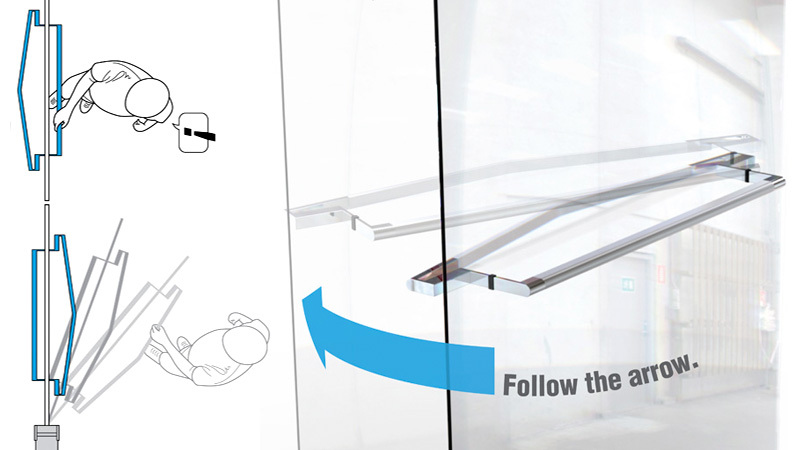 With glass doors it's not always immediately obvious which direction the door swings. Is it towards you, or away from you? And making the wrong decision can be disastrously embarrassing. So we like these arrow-shaped handles that provide a subtle hint whether you need to push or pull. Apple reports schools in more than 600 districts have bought iPads for all of their students. And it’s not happening just in wealthy suburbs. Schools in urban districts like New York City and Chicago are also handing out iPads. In the Boston area, Burlington High School launched a one-to-one iPad program in the fall, providing a tablet for each student. It cost the school about $500,000 for the devices, and the principal, Patrick Larkin, said the school paid for them within its existing budget. The school saved money by getting rid of its computer labs, abandoning plans to build a new language lab and deciding it would no longer buy new textbooks. Larkin said they didn’t throw away the old books, but no longer need to buy new ones, since students and teachers can find everything they need online. Larkin said the school isn’t even buying electronic versions of textbooks, since they end up costing the schools more than traditional ones in the long run. 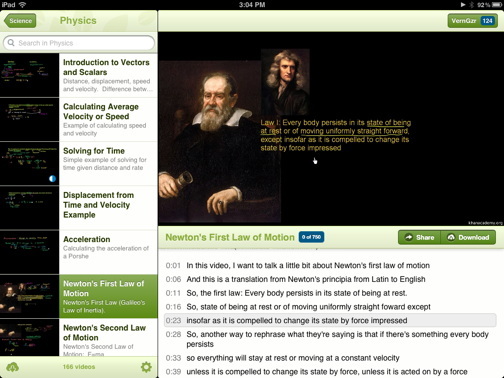 I think I’m going to like Khan Academy for iPad better, and why you might, too. Khan Academy is a virtual learning environment founded by Salman Khan, who is, in his own right, a bit of a super human. He holds several degrees from several prestigious schools covering a wide range of disciplines including mathematics, electrical engineering and computer science. The academy’s mission is to provide a top notch learning environment to anyone who wants to use it, free. These are not lessons cobbled together in an incoherent mass that you have to wade into to tease out the classes you want. The subjects are organized and categorized, and cover lessons geared to students from kindergarten through college and beyond. Take math for instance. You can start with the very basics - addition, subtraction, multiplication and (my personal favorite) division. You scan through lessons you may be familiar with and move on to more advanced lessons covering fractions and trig to differential equations and calculus. The Science and Humanities categories are similarly laid out, so finding what you want or need to learn about is easy. Our children are leading the world's transition to digital media. This is in part because kids aren't afraid of technology, and in part because they haven't spent years getting use to anything else. So if you want to get a sense of where the world's media habits are headed, it makes sense to watch what kids are doing. The Kaiser Family Foundation did just that in a comprehensive survey released a while back. Kaiser surveyed more than 2,000 families, and turned up all sorts of interesting information about the media habits of 8-18 year olds. And bear in mind that this survey came before the iPad. And before smartphones really began to take hold. Kids consume a heck of a lot of media--and more all the time. Basically, if kids are awake, they're consuming media. And, increasingly, they're consuming multiple forms of media at the same time. Kids' print media consumption is tiny and falling. When to Schedule a Make or Break Launch? Easter Sunday? I don't think so. Although online sales - particularly through Amazon – seem to be doing well, why would you launch a flagship device, a device that both Nokia and Microsoft desperately want to succeed on a day when most of your retail outlets are closed. AT&T said last month that when Nokia’s new Lumia 900 phone went on sale April 8, it would benefit from the company’s biggest product introduction ever, exceeding even the iPhone’s. The big day is here. But nearly all 39 AT&T stores within proximity of Times Square in Manhattan were either closed for Easter Sunday or did not answer phone calls. The few that were open did not have the handset in stock. When AT&T stores within five miles of Times Square were contacted around noon, 18 of them played an automated message saying they were closed for Easter. Nineteen stores that were authorized AT&T resellers did not answer the phone, and two AT&T resellers that were open said they did not have the Lumia 900 yet. When asked about the Easter release date on Friday, AT&T’s spokesman Mark Siegel said: “The Lumia has received tremendous product reviews and we have been taking pre-orders online and in our stores all week. We are already off to the races.” He declined to comment further on Sunday. For online sales, the Lumia 900 does appear to be doing well. On Sunday afternoon, it was the No. 5 on Amazon’s list of bestselling cellphones with service plans. Tero Kuittinen, an analyst and a vice president of Alekstra, a company that helps customers manage their cellphone bills, said the Amazon numbers were the sign of a strong product release despite the strange timing of Easter Sunday. Operation Encrypt Everything (OpE^2) was started in 2012 by members of the Pirate Party of Canada to counteract the increasing threat of total communications surveillance by governments and private industry. It is intended to bring together information about protecting your data and privacy online, and making easily-understood instructions available to our digital comrades. By getting in the habit of using good encryption practices, you can ensure that your financial records, web surfing history, conversations with friends, and photos of your loved ones are private, and not endangered by your national government, a foreign government, major corporations like Facebook or Google, or even malicious hackers. When we want something to be secure, we tend to lock it up - and that's what encryption is, a lock and key for your private life, ensuring that your recent credit card purchases, vacation photos, web browsing history or chat conversations aren't going to be on the front page of tomorrow's newspapers...or the topic of family conversation at Thanksgiving. It's not enough to decide that you'll try and protect this photograph, or that e-Mail, if you want true security and privacy, you must...ENCRYPT EVERYTHING! Cell phone privacy guide (Android) requires knowledge of Android. In Bitcoin – Hacking Digital Currency I discussed the idea of increasing the value of bitcoins by buying more, creating more or destroying other people's bitcoins. LOL this is true of all monies and currencies and goods of any type. If some are destroyed, others are more valuable. If some are created, others are less valuable. This is supply and demand. It's not at all unique to nor a special property of Bitcoin. Same could be said for any commodity. If I simply destroy the global gold reserves, my gold will skyrocket in value. It's a pretty stupid "weakness". While this weakness is inherent in any currency, monies, goods, gold, etc – what makes this sort of hack unique is the digital nature of bitcoins. Destroying or hoarding the reserves of gold is an entirely different thing than destroying, hoarding or even creating digital currency. 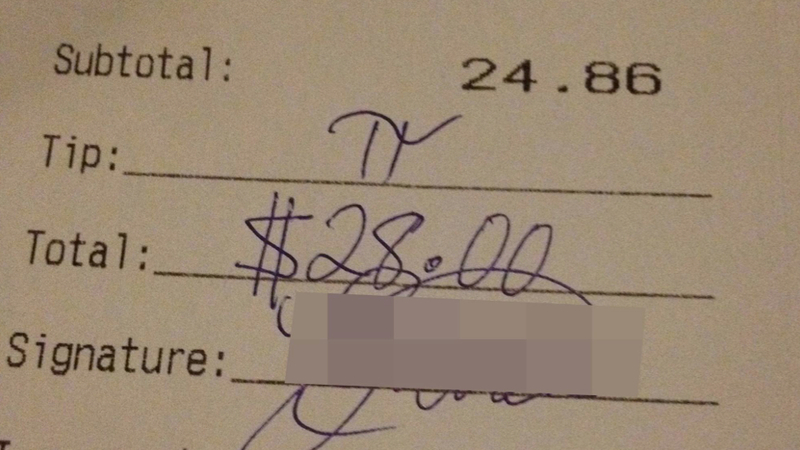 Pro-tip on pi-tips: this will come off as even more clever if you actually ordered pie. Or a pi pie. The Latest Student Craze In China? What's the latest student craze in the US? Beer Pong? Planking? Sigh … I fear that we're doomed. HPC blog In a Wall Street Journal article last Friday, a bit of light was shone on China’s entry into the upper echelon of supercomputing nations over the past few years. In 2007 China had only 10 systems on the Top500 list. But like TV’s George Jefferson adding dry cleaning stores, China has been movin’ on up - it now has 74 of the top boxes. The WSJ story points out that supercomputers in China are often used for local, non-supercomputing tasks rather than the ambitious basic research that these systems typically do in the rest of the world. But there’s another side of the Chinese supercomputing surge – it looks like HPC is rapidly becoming a cool pursuit for China’s university students. The upcoming Student Cluster Competition at ISC’12 sparked a flurry of Chinese student cluster infighting to see which teams will carry the Chinese flag in Hamburg this June. China has been allotted two of the six competition slots, but there are dozens of Chinese universities vying for them. Dan Frommer … Google shows off ‘Project Glass’ computerized glasses project – sounds clunky and cumbersome to me. Nick Bilton has a good overview at the NYT. And Google has posted this video of what a theoretical experience with “Project Glass” might be like. Basically, like using your phone on your face instead of taking your phone out. I don’t doubt that there’s some potential here. And again, I’m trying really hard to be hopeful about this sort of stuff. But so far, I’m not seeing anything that would make the nuisance of wearing special glasses all day worth it. This Nokia phone and its Microsoft operating system are truly lovely — more beautiful than the iPhone or Android software, and, for most functions, just as powerful. But is that enough to make you willing to sacrifice important apps like Scrabble, Pandora and Dropbox? Is “just as good” enough to justify losing out on the universe of accessories and compatibility? I’m rooting for these long shots. They’ve done great work. But I have a sinking feeling that this breed of underdog will turn out to look more like a Pekingese than a Doberman. Director Lee Rainie will dicuss how Baby Boomers use technology at the What’s Next Boomer Business Summit. He’ll explore generational differences in use of the internet and mobile devices and how coming developments in technology might affect their activities and attitudes. My biggest takeaway from using the new iPad? It feels so much better than any Android tablet that I’ve tested (and that’sa lotof tablets), that it’s sort of embarrassing for Google. The big difference is in how Apple and Google are approaching tablets. Apple is pushing the iPad as an entirely different platform from the iPhone, with apps that cater to its larger screen. Android tablet makers like Samsung, on the other hand, initially just recreated the Android phone experience on slates. That was mostly Google’s fault, since Android wasn’t optimized for tablets until Android 3.0 “Honeycomb.” With that release came a few Android apps targeted at tablets, but it was still nowhere near the app frenzy that the iPad has seen. Honestly, even the iPad 2 offers a better experience than any Android tablet I’ve seen, even with its slightly lower specs. But the new iPad’s Retina Display, as well as its faster graphics, put it on another level entirely. Great video. I love e-books and I am convinced that the future of books is e-books, but I love seeing the craftsmanship and personal attention that goes into creating a print book. A short vignette of a book being created using traditional printing methods. For the Daily Telegraph. Shot at Smith-Settle Printers, Leeds, England. The book being printed is Suzanne St Albans’ 'Mango and Mimosa' published as part of the Slightly Foxed series. I troubled not only by the increase in part-time faculty, but also the growth in non-tenure track faculty. Perhaps this shouldn’t come as a surprise – there has been a lot in the media about the rise of non-tenure-track faculty, aka “freeway fliers” because of their need to cobble together multiple teaching assignments to make ends meet. Typically without benefits. And often, poor working conditions.